biographies, autobiographies, & memoirs, oh my! 90 minutes in heaven : a true story of death & life by Don Piper with Cecil Murphey. Summary — The author, a pastor, describes his near-death experience after a car accident in 1989, explaining that he went to Heaven and was brought back to Earth by a miracle, and discusses the impact of the event on his life. Dancing with Max : a mother and son who broke free by Emily Colson ; prologue & epilogue by Charles W. Colson. Summary — Emily Colson shares the story of her experiences as the single mother of a child diagnosed with autism, and tells how she developed her own visual communication system for working with Max. The devil in pew number seven by Rebecca N. Alonzo with Bob DeMoss. Summary — Rebecca Nichols Alonzo recounts the events surrounding her father’s murder, describing how a church member who refused to give up control when Robert Nichols took over as pastor tormented and threatened her family, until the night that Rebecca’s life was shattered forever. Life, in spite of me : extraordinary hope after a fatal choice by Kristen Jane Anderson with Tricia Goyer. Summary — The author shares the story of how she survived a suicide attempt and found hope and peace in her life. Life without limits : inspiration for a ridiculously good life by Nick Vujicic. Summary — The author, a man who was born without arms or legs, describes how he overcame his disabilities to live an independent, fulfilling life and provides advice to the reader on ways to discover their purpose in life. The red scorpion : the true story of a ruthless Russian mob boss’s dramatic redemption by Rami Kivisalo and Marko Joensuu. Summary — Rami Kivisalo, the son of Finnish missionaries in Tanzania, provides an account of how he came to be part of the Russian mafia’s inner circle in charge of illegal drug and arms trades, and discusses events that led to his religious conversion. Shattered : struck down, but not destroyed by Frank Pastore with Ellen Vaughn. Summary — Cincinnati Reds pitcher Frank Pastore stepped onto the mound in Dodger Stadium to throw another fastball — something he’d done thousands of times since childhood. But this time was different. The batter connected and the ball came rocketing back to the mound, shattering not only Frank’s pitching elbow — but also his dream of getting rich and famous through Major League Baseball. This is a story of how the fragments of broken dreams can be reassembled into even bigger and better things. This is a story that shows how all of us can come to know we’re in God’s good hands. Even when we’re shattered. Two wars by Nate Self. Summary — The author, a former Ranger captain, tells his story and the story of those in his unit, as they fought their way through hostile territory in Afghanistan, describing his personal struggles, professional duty to his country and his men, and the long-term effects of the war on terror. Unshaken : rising from the ruins of Haiti’s Hotel Montana by Dan Woolley with Jennifer Schuchmann. Summary — Dan Woolley, an interactive strategies director for Compassion International, recounts the nearly three days he spent trapped beneath the rubble of Haiti’s collapsed Hotel Montana. He details his survival methods — including using an iPhone app to treat his life-threatening injuries, conversations with strangers buried nearby, letters to his family, and the small and large decisions he made that affected his chances of surviving the 7.0 Haiti earthquake that took the lives of hundreds of thousands of people. 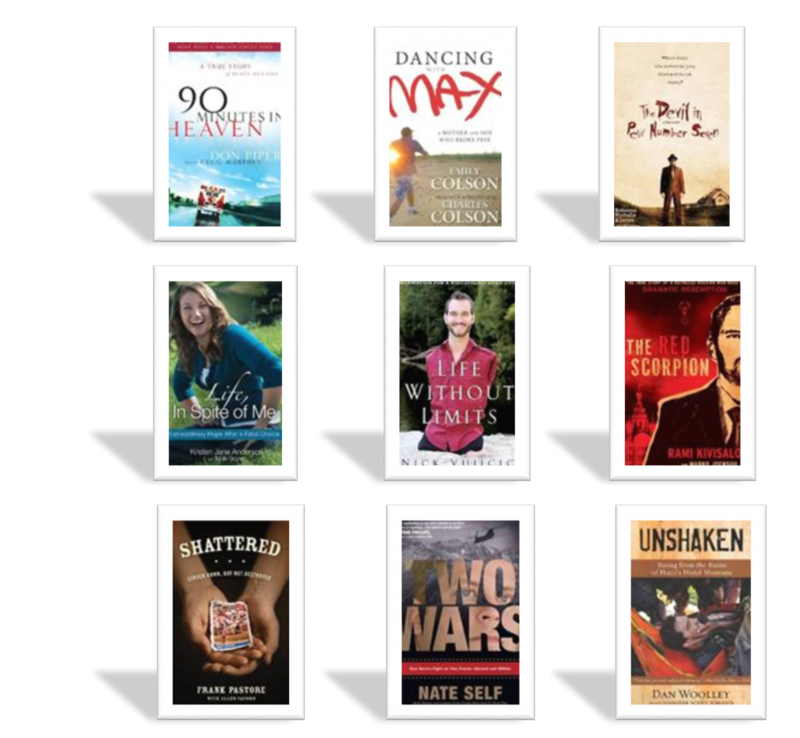 This entry was tagged bible, biography, christian living, history, new books, non-fiction. Bookmark the permalink.